Heat a 1/4 cup of olive oil in a medium size skillet over medium heat. Add in 1/4 cup of all-purpose flour and stir in completely. Note: the mixture will be thick. Allow this to cook for about 2 minutes. Add in 1/2 teaspoon ground black pepper, 3/4 teaspoon salt, 1 teaspoon garlic powder, 1 teaspoon onion powder, 2 teaspoons ground cumin, 1/2 teaspoon dried oregano, and 1 tablespoon chili powder. Stir to form a thick paste. Stir in 2 cups of veggie broth and 1 tbs of tomato paste. Stir until smooth. Bring the mixture to a simmer, stir occasionally, and then reduce the heat. Set sauce aside. Preheat the oven to 350 F and have a 9 X 13 baking dish ready. Heat 1 tbs of olive oil over medium in a large skillet. Add a 1/2 of a small onion and 1/2 of a jalapeño to the skillet and cook for 3-4 min. Add two crumbled Beyond Burger patties, 1 cup of corn, and 2 cloves of minced garlic. Cook for 5 min or until beyond meat is golden brown. Mix in cooked vegan mashed potatoes and cook for a few more minutes. Heat each tortilla for 15-30 seconds on each side. Keep them warmed tortillas inside a towel while you heat up the rest. Add a thin layer of the enchilada sauce to the baking dish. 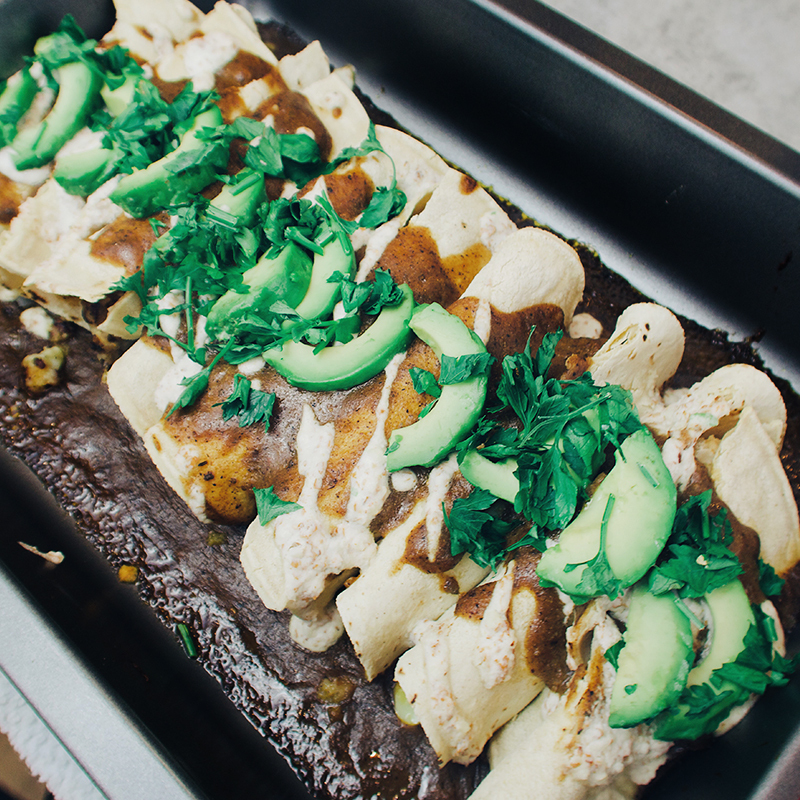 Assemble the enchiladas using a corn tortilla and placing 2 heaping tablespoons of the filling on one of the tortilla edges, not in the middle. Roll the tortilla and place seam side down into the prepared baking dish. Add sauce down the middle of the enchilada. Place the baking dish in the oven and cook for 10-15 minutes, or just until everything is heated through. Garnish with cilantro, lime, almond cream, and avocado. 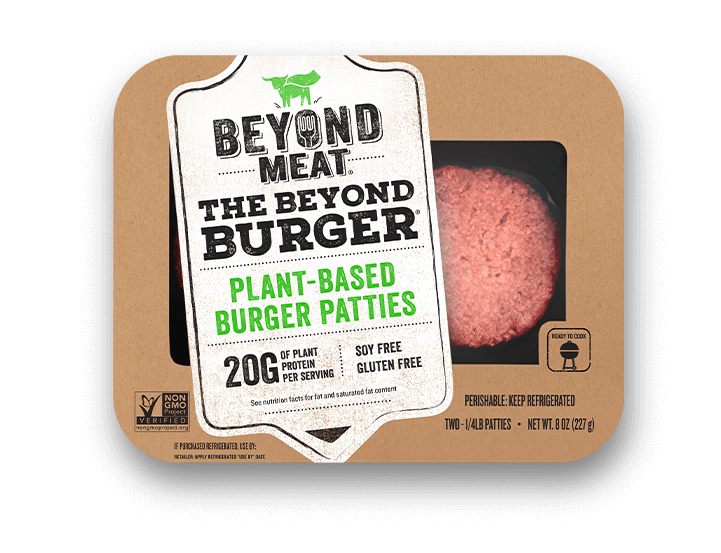 To receive exclusive coupons, availability updates of our sizzling Beyond Burger and Beyond Sausage, and other news you can use, sign up below! By clicking submit I consent to Beyond Meat using my email address and postal code to send me emails about Beyond Meat products, recipes, and more. I understand that I can unsubscribe at any time. GET EXCLUSIVE COUPONS, AVAILABILITY UPDATES, & MORE.